We have seen in events like the America's Cup or the Admiral's Cup that sailmakers are taking a more and more scientific approach in their sail development-programs. WB-Sails has studied 470-sails with the help of the most modern computer tools. This article first appeared in 470 Times in June 1992. WB-Sails chose the 470-rig as one of the first testing grounds for their aerodynamic analysis-program MacSail for several reasons: Firstly, with our long experience of the 470-class we were confident that the shapes of these sails represented well today«s state-of-the art. Also, we had accurate shapes available through normal photography as well as photogrammetry. Another important factor was that the level of racing in the 470-class represents (both internationally & nationally) the highest standards. The MacSail-calculation program is based on a system called "vortex-lattice method". 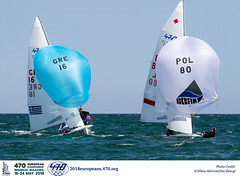 In this method, the sails are replaced by a 3D-grid, dividing both mainsail & jib into approximately 100 elements. Flow velocity is calculated in the center of each element, on both leeward and windward sides of the sails, taking also into account the effect of the jib wake (backwind) on the mainsail. From flow velocity, the pressure can be deduced, and by adding the windward side pressure to the leeward side suction, the pressure difference in each element can be obtained. This pressure acts perpendicular to the element surface, forming a small force vector. Summing up all these small vectors in each element gives the magnitude and direction of the total force acting on the jib & the mainsail. As you can see, the jib seems to contribute much more (relatively) to boatspeed than the mainsail, but don«t get it wrong: it only does this because it is working in conjunction with the main. 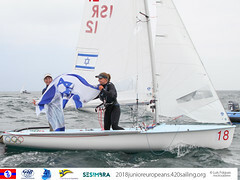 In fact, the jib is receiving a strong "lift" from the main, while the mainsail is experiencing a bad header due to the jib (the jib, after all, is in a "safe leeward position"). Take the main out, and the jib will lose its magic. Note how very small the actual driving force pulling the boat forward is, some 22 kilos. In this light, it is easy to understand, how important every little detail, from aerodynamic clothing to an open bailer or dragging spinnaker sheet, not to mention hitting a wave badly, is to getting the maximum out of your boat. For the purpose of the calculation, the sails are divided into approximately 100 elements each. Different shades/colours represent a different surface pressure according to the table on the left. You can tell from the colours that the pressure is far greater in the upper part of the sails, and even more so in the jib than the mainsail. This is partly due to the triangular shape of the sails, and partly to the intensional shaping of the sails to minimize vortex induced drag. The jib represents 40% of the total force of the sails, although it is only 30% of the area. Nearly 50% of the forward drive comes from the tiny jib. The difference in flow velocity on the windward & the leeward sides creates the pressure difference. The pressure difference is the cause of the driving & heeling forces excerted by the rig onto the hull. Here we can see the calculated flow velocity on the leeward surface of the sails , in a free stream velocity (apparent wind speed) of 8 m/s. A flowchart such as this gives the saildesigner a wealth of useful information. You can see, how the flow is accelerated on the surface of both sails so that the speed of the flow is nearly everywhere greater than the wind speed. Near the head of the sails the speed is almost doubled, ie. 14-15 m/s. The influence of the jib can clearly be seen on the main surface - the flow is decelerated in the slot between the two sails, not accelerated, as you often hear claimed. The velocity on the surface of the jib is larger than on the main, and even in most of the leech area it is higher than the wind speed. As a result, the flow is less prone to "separate", and thus the jib can produce a greater drive in conjunction with than mainsail than it would alone. The flow separates, if it is forced to slow down too much too fast. The jib maintains higher velocities all the way down, because the foot lies on the deck, while in case of the mainsail, the pressure difference tends to even out under the boom, thus making the lower part of the sail less efficient. The flow has to slow down to the free stream speed in the leech of the mainsail, which makes it prone to separation. Separation always occurs first in the head of the sails, where acceleration & the following deceleration is big. In the front part of the main, flow velocity is nearly the same as wind speed - there«s hardly any pressure difference, the sail is close to backwinding. Although calculations such as these give a wealth of useful information to the saildesigner, it would be wrong to expect a miracle shape to come out of the computer as a result. We can only optimize the sails for one given wind condition at the time - and although we can simulate mast bend and forestay sag in the computer, the true art and skill of the sailmaker comes out in the intricate balance between the seam-induced, moulded shape and the luff curve shape, combined with the rig characteristics and the fabric strech, to produce a suit of sails versatile enough to power the boat from the lightest zephyrs to the choppy seas in heavy breezes. So, even in this computer-age, the ultimate proving ground of a new suit of sails remains the race course, the way it should be. 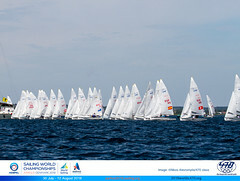 Copyright © 1995 WB-Sails Ltd. All rights reserved.